China is manufactured by many companies, and if you inherited a set of china or purchased it from a secondhand dealer, it can seem nearly impossible to identify the pattern in order to research its value or find replacement pieces. However, you can find out the name of the pattern of your china. Check the back of pieces in your china collection that you are trying to identify. Manufacturers typically mark their china with their name. Many manufacturers also print a code or number on the bottom to denote the pattern number. Start with the dinner plates and pieces with a larger surface area -- they’re the most likely to be marked, though many manufacturers mark all of their pieces within a pattern. Visit the manufacturer’s website if the bottom of your china is marked with a maker’s name. Many china manufacturers have pictures of new, old and discontinued china patterns in their collection. Use the MatchYourDinnerware.com database to identify a china pattern if you know the name of the manufacturer. 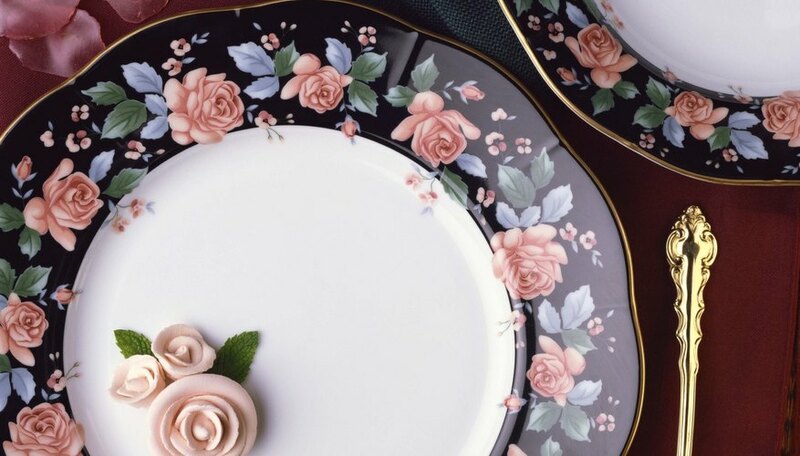 The MatchYourDinnerware.com database contains simple images of many different china patterns by a variety of manufacturers for easy identification. Contact the manufacturer if your china is marked with the maker’s name but not the pattern. They might be able to help you identify your pattern over the phone if it’s particularly distinctive. Some companies might require a picture or information that could help identify the china, such as when or where you bought it. Buy or check out a book from the library to help you identify you china pattern. Look for a book that is relevant to your china in some way. For example, if you’re trying to determine the pattern of antique bone china, look for a book that deals exclusively with that. Country of origin, use, such as wedding china, or a material can also help you find the right resource book to identify your china pattern. Seek help from a professional. Antique dealers and auction houses might be able to help you identify your china, even if you have almost no information about it because they have access to resource books and source material to pull from as well as expert knowledge in the field. If you’re not interested in selling your china, you may need to pay a small fee. You can also have your china appraised for insurance purposes at the same time. If your china is particularly old, there’s a chance that the manufacturer’s identification has rubbed off some pieces because of normal use and washing. Check pieces that aren’t frequently used such as gravy boats for identifying marks.